The statement "The airport was there first" is only partially true. It is true that a tiny (60 acres) private airport with a single runway between Tully Road and Cunningham Avenue existed before many of the schools and homes were built in East San Jose. However, Santa Clara County did not purchase this private airport until 1961, and the present airport was not built until a few years later during the mid-to-late 1960s. This 1961 USGS map of East San Jose clearly shows the original Hillview airport was already partially surrounded by homes before the county purchased it. Unfortunately, it does not show the new home construction to the North and South-East of the airport that was either in progress, or planned, at the time of purchase. However, that does not mean that the county was unaware of these homes when the county made the extremenly poor decision to buy the Hillview airport. Even an airport history by a flight school at RHV acknowledges that the county did not build this airport until the mid 1960s. It turns out that the majority of schools and homes in this area were either already built or approved before the current version of the airport was built. For example, the Thomas Ryan Elementary School behind my house was built in 1953 and my neighborhood was built in the 1950s. By the time the county finished expanding the airport, the land north of Ocala Avenue had been developed. So, the current airport was not here first. The neighborhood was here first. The schools and homes were here before the county bought the tiny private airport. The schools and homes were here before the county closed Cunningham Avenue to expand the airport grounds. The schools and homes were here before the county lengthened the runway between Tully Road and Ocala Avenue. The schools and homes were here before the county added a second long runway to increase airport operations. The schools and homes were here before the county added runway lights to allow night operations. The schools and homes were here before the county allowed an FAA control tower to be built. The schools and homes were here before the county allowed the FBOs and flight schools to operate at RHV. 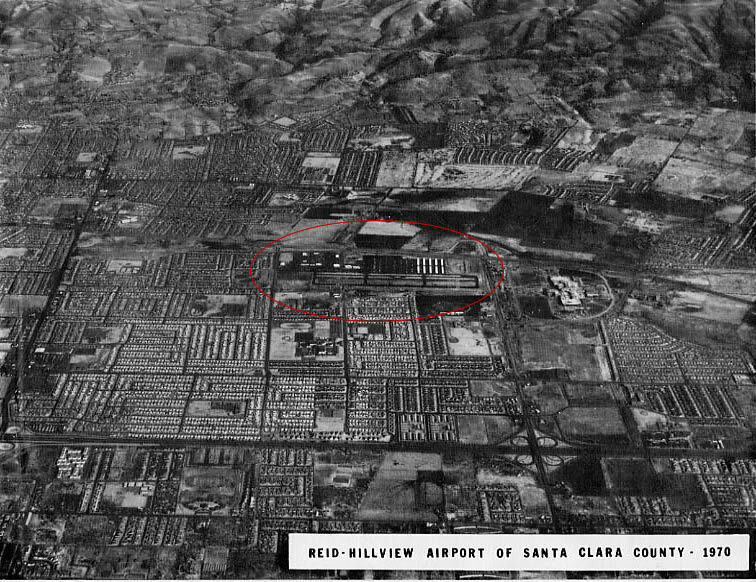 An aerial photograph of RHV taken in 1970 by Santa Clara county of the just finished airport, clearly shows that housing was already present before this airport was built. After all, it takes much longer to build housing divisions than it does to pave simple, straight runways. Airport supporters like to complain that San Jose made poor land-use decisions by allowing these schools and homes to be built. Actually, it was the county that made a terrible land-use decision by allowing a recreational airport to be built in the middle of a residential neighborhood. The county was aware of the existing and planned development in this area, yet they chose to ignore it and built RHV. The county created this monster and, like all man-made monsters, the county cannot control their creation. It is the responsibility of the county to put an end to this monster. I have asked the county for some historical data regarding the purchase of the airport. This is a partial listing of my request. What was the size of the airport purchased in 1961? What were the boundaries of the airport purchased in 1961? How many planes were based at the airport purchased in 1961? How many people were using the airport purchased in 1961? Was the airport runway paved or dirt at the airport purchased in 1961? When was Cunningham Avenue closed to allow airport expansion? When was the runway expanded between Tully Road and Ocala Avenue? When was the 2nd runway added? When were the runway lights for nighttime operations added? When was the FAA tower built? How many public meetings were held with the community regarding these changes to the airport? When and where were these meetings held? When were the FBOs on the airport granted their leases? So far the county has been unresponsive in providing this information, but I will continue to research this area. As I obtain more information I will make it available on this page. I think this newspaper quote summarizes the history issue. "Reid's Hillview Airport, once an isolated Eastside airstrip for light planes, now is nearly ringed by schools, school sites and subdivisions." Although this sounds as if it were written today, it is from the San Jose News, page 17, April 16 1962. At this time, the county had just purchased the 60 acre Hillview airport from the Reid brothers, and 3 others. Further in, it quotes Superintendent Frank Fiscalini, East Side Union High School District, speaking to the planning commission in regard to the proposal to close Cunningham Avenue in order for the county to expand the airport. "Fiscalini on Tuesday argued before the planning commission that an expanded airport would be a hazard to children in adjacent schools, that subdivision growth would be discouraged and that flight patterns would bring planes close to existing and planned schools." It goes on to say the planning commission concurred, and rejected staff's proposal to close Cunningham. Obviously, at some point the commission's vote was changed, overruled, or ignored, since Cunningham was closed and the airport tripled in size from 60 acres to 180 acres. Mr. Fiscalini did not know just how prophetic and accurate his statement, "would be a hazard to children ", was at the time. Then, the severity of lead poisoning on children was not understood as well as we understand it today. © 2000 Bud Beacham. All rights reserved. Page created March 2001. Updated June 24, 2006.